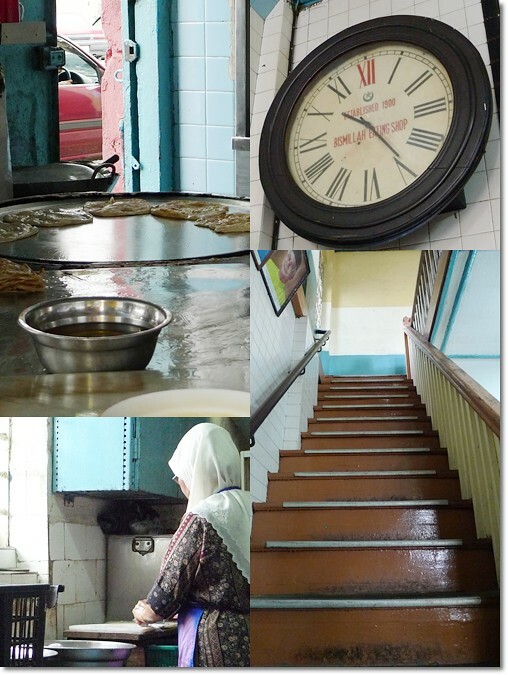 An old favourite of many in Taiping, and from places beyond …. 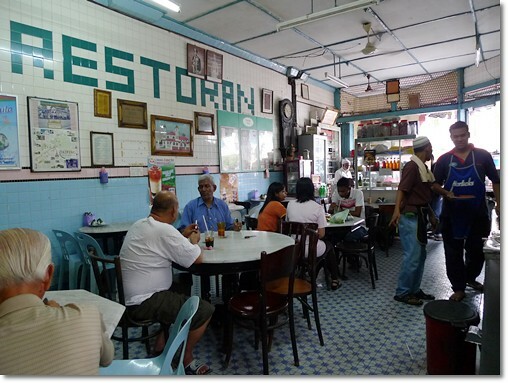 Bismillah Restoran on Main Road (Jalan Taming Sari) should be enlisted as a UNESCO World Heritage Building! Midweek Blues anyone? Or plain reeling from the late night footie matches on the telly, or down at your favourite watering hole? 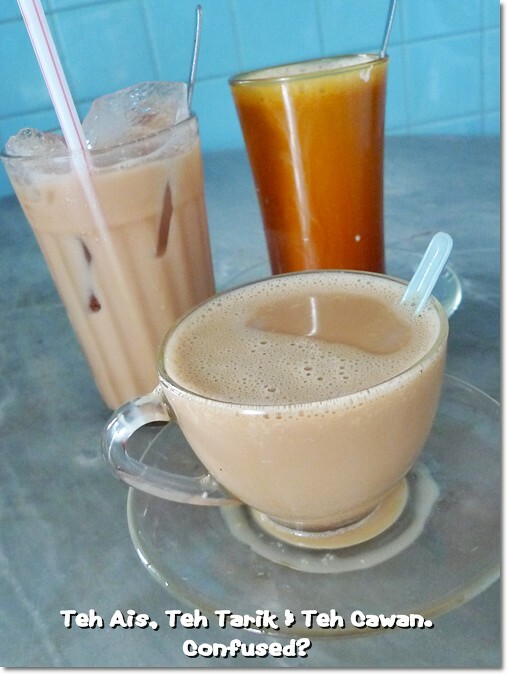 Here’s something to sober you up …..
A perfectly simple, MALAYSIAN breakfast at one of the coolest town (in every sense of the word) in Malaysia; Taiping. 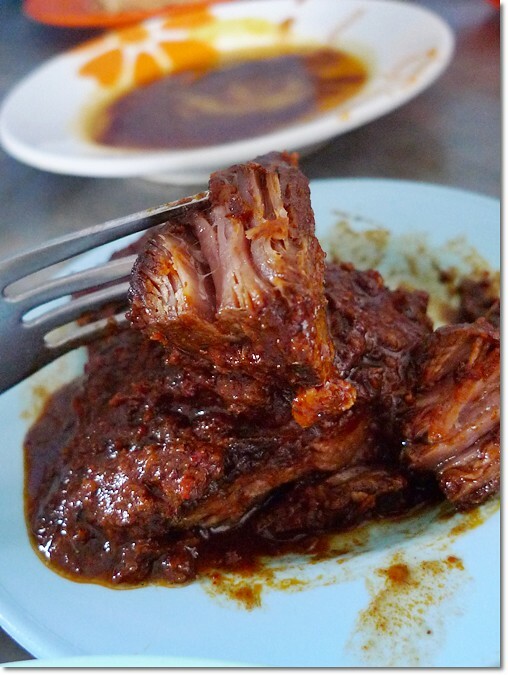 Daging Itam (a type of dark, fiery and robust spiced Beef dish) RM2.50/USD0.70 per portion. 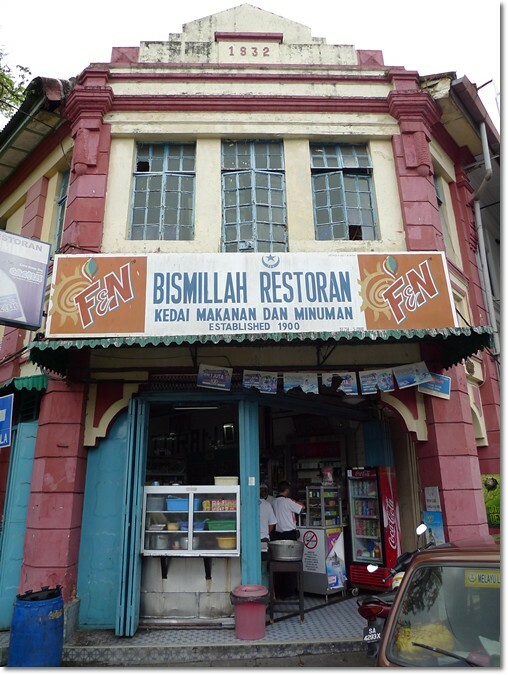 Bismillah Restoran in Taiping is a century’s old establishment, and has been around at this same building for close to 80 years now. Yes, count them, EIGHT DECADES of legacy. 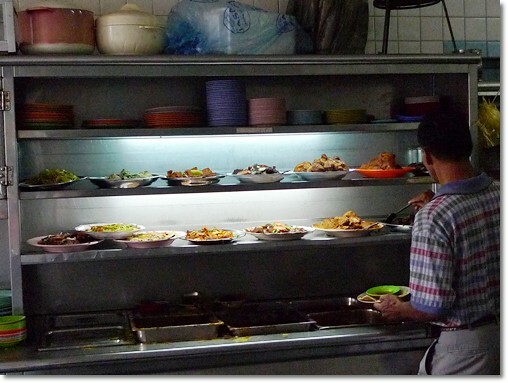 We were there for breakfast on the same day that we had a great Hainanese lunch at Wan Li. Arriving at about 10am, the place was already buzzing with people; and we had to be seated at the back portion of the shop. The blue mosaic floors, the antique clock on the wall, rickety wooden staircase leading to the upper floor, and the ceramic tiles lining the walls (with the restaurant’s name displayed artistically with green tiles instead of white!) all exuded a sense of nostalgia. You can’t help but wonder if the ambience has not changed since their inception aeons ago. A breakfast at Bismillah is not rushed; as you’d be tempted to sit back, take a sip of teh tarik (Malaysia’s famous pulled milk tea) and slowly, nonchalantly tear that piece of roti canai apart and savour …. Being seated at the rear portion of the shop, we missed most of the action in front. The stretching of the dough, the tossing and flipping of the roti, and the bustling crowd tucking in into their roti’s. But we were not complaining one bit; for we believed it was the food that matter most. Clockwise from top left : Roti Telur all torn up, the Sambal Dhal, the whole ensemble of Roti Canai, Sambal Dhal and their signature Daging Itam, and Sugar for the Roti’s, anyone? 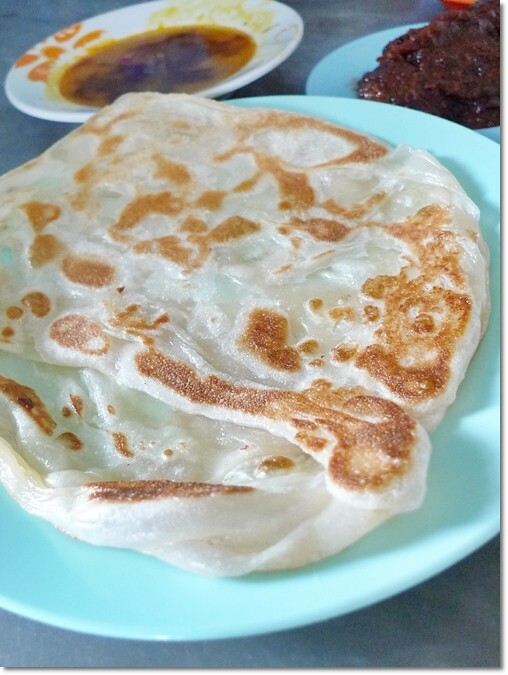 I read from a blog somewhere (I am so sorry, but I have lost your URL) on how the Roti Canai MUST go with their Daging Itam (I hope I got the spelling right!). The dark, almost blackish pile of beef was infused with so much spices and chillies, one bite and I was sold. Very intense, robust and tender, the plate of beef that resembled the more common Rendang Daging tasted redolent of cumin, shallots and a little sweetness from the sweet soy sauce (kicap manis) used. However, this must be paired with plain roti canai, or white rice, as the beef was a tad salty on its own. If Roti’s are not your preference, pick from the variety of dishes (nasi berlauk) to go with white rice, or Nasi Briyani. Yes, you can have an early lunch/brunch here. The Roti Canai at Bismillah was good; one of those type with substance rather than airy, crispy and light (the Pandamaran’s superb version comes to mind). But I have had better versions elsewhere. The Sambal Dhal was a letdown however, being a little too watery to my liking. And you can request for sugar instead; a throwback to the childhood moments when curries was a big no-no. Hey kudo!!! Yeah, I was googling for your post on Bismillah, but could not find it. After all, I saw what you wrote about the place before I went, esp ordering that ‘dagen itam’ you mentioned. 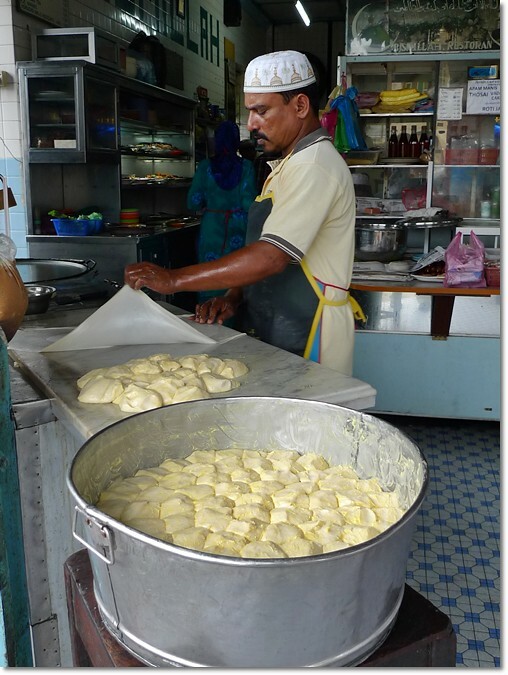 The roti canai is in a good shape and color… In KL here, most of the mamak serves roti canai with some weird shapes and sometimes its color is like a little bit of brownish.. as if it has been made for some time..
Hey really? 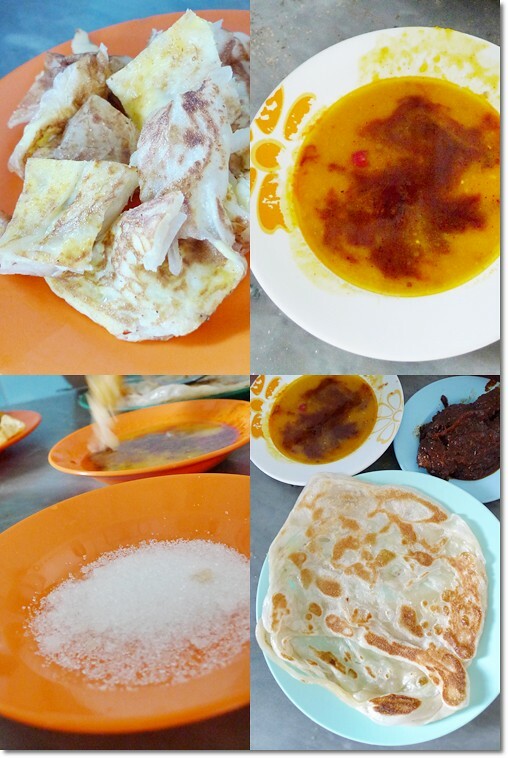 Initially, we thought the roti canai looked a little dull … proof was in the taste, as usual. And rather ample portion at that. However, I forgot how much per piece. Maybe around RM1. Indeed the verdict is in the taste, for at first glance I thot the roti canai looked kinda sad! Try roti canai with ” Daging Cincang” instead. Inform the guy to separate the kuah “dhal” and kuah “hitam”. The kuah from Daging Cincang serves as the third sauce. After an experience with a few thousand Bismillah roti canai, for me this is the best mix. A FEW THOUSAND roti canai?!!! Cendol sekarang ialah Bismillah Cendol kat Jln Barrack dekat hospital? Nama sama, tapi tak pasti gerai sama tak. Oh I still cant forget Taiping and KE VII although I lef them nearly 35 years . Now I’m so far from Taiping. I will return some day. hi, u can try the roti bakar in wanli taiping next time, having stay in ipoh for 2 years, I personally think that wanli’s roti bakar is the best! Okay thanks … will do so. I miss the food there by the way. Been there only once and Wan Li created such an impression on me. This is arguably the best roti canai I’ve ever tasted. I’ve been eating this roti cani since I was a little kid. My late father always brings our family for breakfast here everytime we’re back to our hometown in Kemunting/Ulu Sepetang. The roti canai is best enjoyed with the daging cincang. Yes, the beef curry right? Loved that. Was supposed to eat much in Taiping yesterday, but could not since time was the limiting factor. How I miss Taiping days. doing it on their own or looking for a inexpensive but skilled provider to work on it for them. Im was worked with my previous owner of this restaurant thatvis Haji Hussin. My picture is there. Thank you for the picture. Does it serve roti canai in the afternoon/ night time?